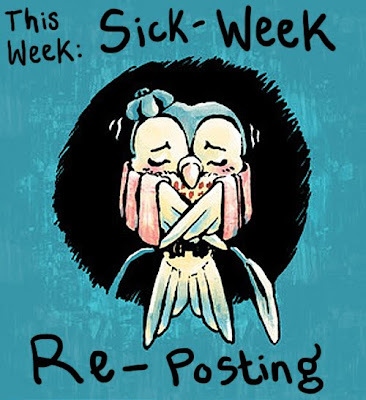 I was too sick this week to make the tutorial I was planning, but I guess someone tipped off the universe because people sent me awesome tutorials to re-post instead. Sneaky Dragon is a podcast I do with Ian Boothby, writer for Simpsons and Futurama comics. Hope you find it interesting. The next tutorial link was sent to me by my friend Emily, who's writing the comic I'm working on. 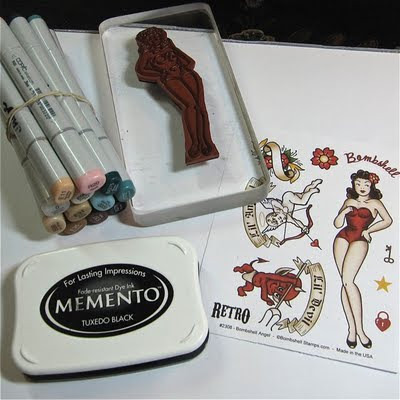 It's a pretty decent little tutorial on marker coloring. I hate markers as a tool, just in a tactile sense, so I don't post much about them. They're expensive, and I don't think I could stand drawing with them enough to execute a tutorial post even if I wanted to pay for them just to do such a post, so I'm happy to have this to post. Marker work can be beautiful when well done. Jamie Hewlett did some gorgeous marker colored pages for Tank Girl years back, for instance. The key is to blend them properly and not have streaky lines showing, which is not easy. Kate Beaton did a comic about her bad cartoonist posture, an issue we can all identify with. Those of you who read last week's entry might have gone to your libraries to see what comics did a good job of making you really feel their environments, and which fell short. Allow me to show you a new webcomic by Ryan Andrews that conveys the changing of the seasons with great sensitivity. Look at how the light changes from summer to winter. The clothes change, the air changes, the sounds change. And yes, you can see the character's breath when it's cold. What a gorgeous, eerie work this comic is. That's all for this week, see you next week! David's lightbox desk is pretty awesome! I don't think I'd ever be industrious enough to build my own desk. I've got an old animation lightbox with the rotating plexiglass disc in it, which is incredibly handy for illustration work. I agree about markers, too. I don't like how they feel, something about hard felt on paper just doesn't feel right to me. Though guys like Adam Hughes do amazing things with them, so maybe I'm missing out. Holy snap! ... I must concede defeat! 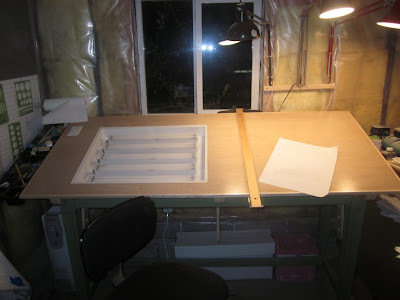 That light table is totally badass. I love the artist mentality of "eff it, I'll just make it myself." I can't even count the number of tools I saw my classmates invent in college to help themselves! Truly, we are the coolest people in the universe.